Photographs by award-winning environmental photographer Ian Adams and botanical art by Dianne McElwain showcase the beauty of the home's architecture and the myriad of native plants that grace the three acres on which the Residence stands. Dianne McElwain is a member of the American Society of Botanical Artists in New York. Her botanical paintings have won numerous awards and are found in prestigious collections throughout the United States. 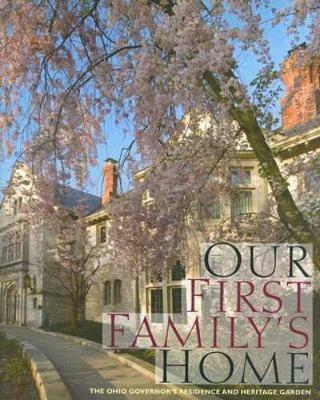 Essays highlight the Jacobethan Revival architecture and the history of the home. The remaining pieces cover the garden and include an intimate tour of the Heritage Garden, which was inspired by Ohio's diverse landscape. Finally, Governor Ted Strickland and First Lady Frances Strickland discuss the increasing focus on green energy at the Governor's Residence and First Lady Emerita Hope Taft explains how native plants can help sustain the environment. "For those who have never visited the Ohio Governor's Residence and Heritage Garden, this book is a true inspiration to do so.... Beautiful photography by Ian Adams is found throughout the book.... One of the most beautiful aspects...is the chapter of botanical art drawn by award-winning botanical artist Dianne McElwain.... This wonderful book of Ohio history, architecture, and horticulture ends with an inspiring afterword by Hope Taft." "With the help of many expert contributors this book takes you on a journey through time, proving the residence is more than just a temporary house for a government official, but also a representation of our state's pride." "This title is a treasure-trove of information.... The in-depth plant profiles are incredibly thorough with details on pollination and the plants' relationship to wildlife." "[Our First Family's Home] shows that the residence's purpose is more than simply a dwelling place for a political leader; it is part of a history that is meant for all Ohioans to appreciate." "No matter what your political persuasion, there'll be no heated debate about the governor's residence. Quite simply, it's magnificent." "The book is filled with gorgeous photographs, mostly in color, of the Residence and grounds.... This is a book you may pick up to view the pretty pictures, but don't ignore the text." Mary Alice Mairose is the residence curator at the Ohio Governor's Residence. Ian Adams has twenty-one photography books and more than sixty-five Ohio calendars to his credit. He conducts nature and garden photography seminars, workshops, and slide programs throughout North America and teaches digital photography at Ohio State University's Agricultural Technical Institute in Wooster. Dianne McElwain is a member of the American Society of Botanical Artists in New York. Her botanical paintings have won numerous awards and are found in prestigious collections throughout the United States.